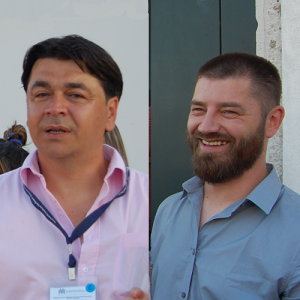 Vahidin Omanovic and Mevludin Rahmanovic are the co-Founders and co-Directors of the Center for Peacebuilding (CIM), located in Sanski Most, Bosnia and Herzegovina. Mr. Omanovic, a trained professional in non-violent communication strategies and conflict resolution, has a Master’s Degree in International Relations with a concentration in Conflict Transformation from the School for International Training (SIT) in Brattleboro, Vermont. Mr. Rahmanovic, a certified Trainer of Trainers in dialogue and nonviolent communication, holds a diploma from the Theological School in Travnik, Bosnia and Herzegovina. The two jointly founded the Center for Peacebuilding in 2004 and have since served as instructors at multiple editions of the Global Raphael Lemkin Seminar for Genocide Prevention. What are some of the biggest challenges in your work on the prevention of mass atrocities through peacebuilding in Bosnia and Herzegovina? Vahidin Omanovic: Speaking from our own experiences, we are working in a very specific environment where we have had genocide and mass atrocities committed within the last twenty years. So, we’re not only dealing with a generation of those who were victims in these atrocities, but we’re also dealing with murderers. On top of that, we’re dealing with the next generation. Among members of the newer generation, secondary traumatization is very obvious and clear to see. With regards to this split, the original generation actually has memories of coexistence, from before the war in Yugoslavia began. Thus, it’s often much easier for them to embark upon a path of reconciliation and personal transformation. The new generation, however, was raised on a sense of nationalism and chauvinism. These values were being taught in school and reinforced by what they saw in the media. It’s much more difficult to establish the necessary level of trust among them. We know that the best way to proceed in our work is to bring people from the different sides together so that they can participate in a structured dialogue about what happened and how we, as a society, can continue on in light of that. Speaking from the perspective of our own work and our own experiences, we really strive to directly confront what happened. This allows us to come face to face with all of its ugliness, but also with all of its beauty – when it comes to the human level. We have so many examples of humans choosing to help other humans, often risking their own lives in the process. Mevludin Rahmanovic: The first thing that we prioritize in our work is the recognition of all victims. We see how easy it is to neglect this, to deny things and say that they didn’t happen, despite historical facts. It has all been a big lesson for us, making a conscious effort to respect and recognize the victims from all of the sides of the conflict. It is really not the easiest thing. It’s not easy to listen to those from your own group, your own nation, or your own religion, talking about how they committed a crime or something else along those lines. This is something that we have really noticed a lot in our own work. Unfortunately, it is still possible to remain silent about these things. This is something that existed before and made it very easy to start war again. Nobody talked about war crimes from World War II, World War I, or even from conflicts before those. In our work, we strive to recognize and respect all victims without counting or comparing their suffering. We see it as our obligation to recognize them. This allows, in a completely new way, a higher level of understanding and respect to be established from each side in comparison to what we are used to in Bosnia. What are some of the lessons that the rest of the world can learn from Bosnia and Herzegovina? Vahidin: In the specific case of Bosnia, you see that there are really no winners in war. Everyone is a loser. I just wish that politicians and other leaders who are looking to start wars in the future would really think about the fact that one person lost in conflict is a person lost to us all. In our peacebuilding work, we’ve been discovering more and more that absolutely everybody in Bosnia has lost because of the war. If nothing else, we’ve lost years of our lives to struggle. Even if people didn’t lose their family members or their property, they’ve still lost four years of their lives. This, specifically, is the lesson that I would hope that the world could learn from us. I also really want for this message to be said: The world believes that we have peace in Bosnia. But what we really have is the absence of war. What we have is the last stage of genocide, which is denial. We have just recently had an unconstitutional referendum and, already, on the following day people were preparing for war by buying extra food, by traveling outside of Bosnia, etc. Bosnia is a very vulnerable society and we want the international community to understand that we are still in the process of resolving our conflicts, though we are working hard on the prevention of future violence and genocide. However, at the moment, we are very far away from a sustainable peace. How did you become involved with peacebuilding? Vahidin: In 1992, when the war started, I was 16 years old. I lost everything I had, in terms of material possessions. I lost my home, many members of my family, and my life as I knew it. I ended up in a refugee camp in Slovenia. After returning to Bosnia and really facing all of these losses, I had the opportunity to experience what peacebuilding work really is. That was the moment that I realized that we shouldn’t be leaving this burden for our future generations. We must deal with this ourselves and we must work towards preventing our children and grandchildren from inheriting it. Mevludin: It was quite similar for me. I was being pulled between what my religion was asking for me to do and what I thought it was best to do. I always say that I was so happy to have met Vahidin and for us to have spent so much time together, talking about what had happened. After the war, I was such an angry person and I wanted revenge. I wanted to kill every Serb on the planet. When we tell our stories, Vahidin and I often talk hypothetically about having a magical button that would allow an individual to immediately kill all Serbs, everywhere in the world. I can say that, after the war’s conclusion, if I had owned one of these buttons, I would have pushed it. There’s no doubt about it. I would frequently plan and dream about how to obtain revenge. However, I managed to find the resources to pursue peace through my religion. I realized that, as my Prophet has set an example that I should follow in my life, I needed to forgive what had happened. But also, beyond that, I have to do everything in my power to talk about the conflict and to show everyone that what happened was wrong and cannot happen again. As Vahidin has said, I would never want my children to experience something similar in war, so I will do everything that I can to prevent it. Again, I would not call myself a pacifist, but I believe that peace and reconciliation is the best way for the future, for everyone here. If we continue with wars, as we have done in our past for hundreds of years, nothing will change. We will just have history repeating itself every 20, 40, or 60 years. Can you speak about how the Center for Peacebuilding was formed? What existing needs does it respond to? Vahidin: The first reconciliation project that we worked on was actually held between two Bosniak sides that fought during the war. Following this, we embarked upon a longer three-year project. This project really showed us that we can do this work and that there is real hope to be found in it. It led us to establish the legal framework for the Center for Peacebuilding, through which we have continued and expanded our activities. Mevludin: After our first project, dealing only with Bosniak Muslims, we realized that we are actually good at this work. We decided to create even more projects, involving every side of the conflict. However, in order to do this in Bosnia, we absolutely needed a legal framework. This was the direct motivation we had for founding the Center for Peacebuilding, as it exists today. Vahidin: We believe that the best way forward for people here is to provide a space where people can sit and talk about what happened in order for us to help them to discover what is missing so that people can begin to forgive and move on with their lives. Back in 2002-2004, Bosnian society was very divided. Bosniaks wouldn’t dare travel to the Republika Srpska and Serbs wouldn’t dare come to the Federation of Bosnia, despite the fact that we are, officially, one country. This is why we feel that we need to respond by bridging this gap that exists between Serbs and Bosniaks, as well as Croats and everybody else. Thus, we started to create projects and activities that responded to the specific needs that we identified through our discussions with people in local communities. One of things that we focused on heavily was inter-faith dialogue. People kept telling us how crucial it was that religious leaders appear in public together, preaching and working towards peace. It actually took us 5 years to get all of the different religious leaders from one single community to sit around a table. This shows how deep the division was. At that time, it felt impossible to bridge. We are very grateful to have been able to say that we have succeed in bridging so many gaps over the past 13 years, though we still have so many more to go. Regarding the work that you do, what are some of your favorite parts? Who or what continues to inspire you in your efforts? Vahidin: Of course there are so many, but for me one of my absolute favorite parts is working with the youth – teaching and training them to be Peace Multiplicators in their local communities, as well as motivating them to actively work at building peace on a daily basis. At the moment, we are developing a reconciliation and peacebuilding project that will be implemented on the national level. This program would allow us to use the Multiplicators that we’ve trained over the past 13 years to develop peacebuilding efforts in all of the small communities where they live. Once we have achieved a critical mass, we hope to be able to include the involvement of government at the local, federal, and national levels. Mevludin: For me, my main inspiration is definitely God. That is my charging battery. We had a very hard and difficult time, starting our NGO. We have been given many labels by our detractors – being called everything from CIA agents to betrayers – but I knew that we were on the right path, doing something for the good of humanity, so this did not bother me. Another thing for me is our Peace Camps. On the first day, youth participants arrive with very strong and often very dangerous beliefs. After our seven days together (though it has taken some participants all the way up to a year to make this transformation), when I see what they have become… this is something that really gives me hope and the strength to continue on. In Bosnia, everyone is so desperate. They do not see the future. They see only hopelessness. Since the beginning, everyone told us that our work and our goals are impossible. But seeing us succeed in our work and the impact that it has on people’s lives makes me feel like it actually is possible and that gives me hope.